They would stay in the water day and night if we would stay! Husband Chad, our youngest Josh, Decoy, Primo and oldest son Jerry. Primo lived until he was 14.2. Decoy is still with us and enjoys his muddy pond. He will be 10 years old on 2/5/2018. 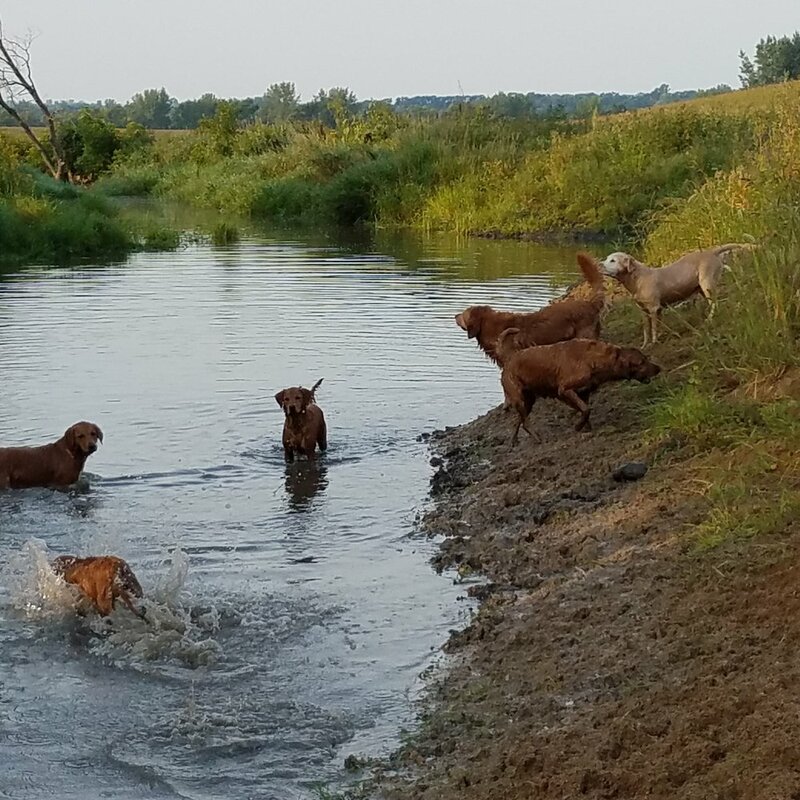 Our dogs are not kennel dogs they are family, they have a 200 acre farm with a ton of beautiful area to hunt, swim and play. We love our goldens and the puppies we raise for families that will cherish them for years. 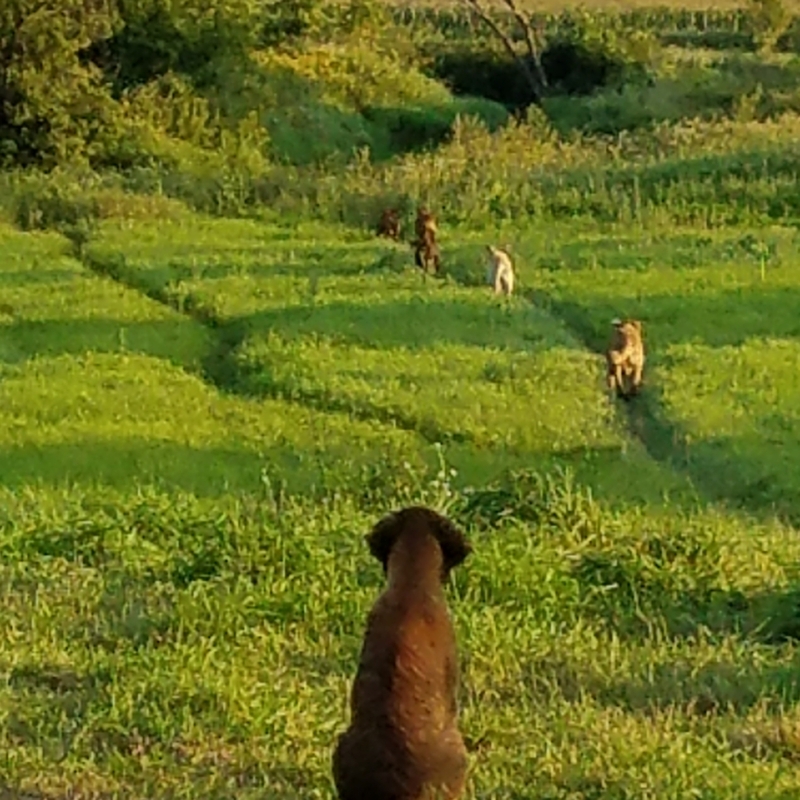 We believe the lower we can get with our COI ( Coefficient of Inbreeding ) the healthier your pup will be. We are always working to make golden retrievers as a whole healthier by looking at our breeding program and trying to incorporate lines that are not inbreed. Another way we have found to keep our dogs healthy is to feed cancer free foods and use the bare minimal toxic substances such as flee and tick pills or topical, over doses of shots and NO store chemical treats. We dont spray our lawns with toxic weed killers. Our thoughts about food that is fed everyday should not contain cancer causing preservatives which are not listed on the bags but all store bought foods have them in to keep them from spoiling. We only feed food from http://Vetmadepetfoods.com because it doesn't have additives and contains only healthy whole foods..
As you read you will see we are trying to create puppies for families that will care about the health of Golden Retrievers. Its really up to us to help this breed thrive! Once you own a golden you will not live without one.. They will always for all the days of their life cherish you unconditionally. They will melt your heart daily and when you loose the best dog you have ever owned it will crush your heart in an unbearable way. That my friends is what a Golden Retriever is all about.. We have had the pleasure of many and each that have passed have been the best dogs we have ever known.. Love deeply to all our golden friends!